Take a look at the above cover. 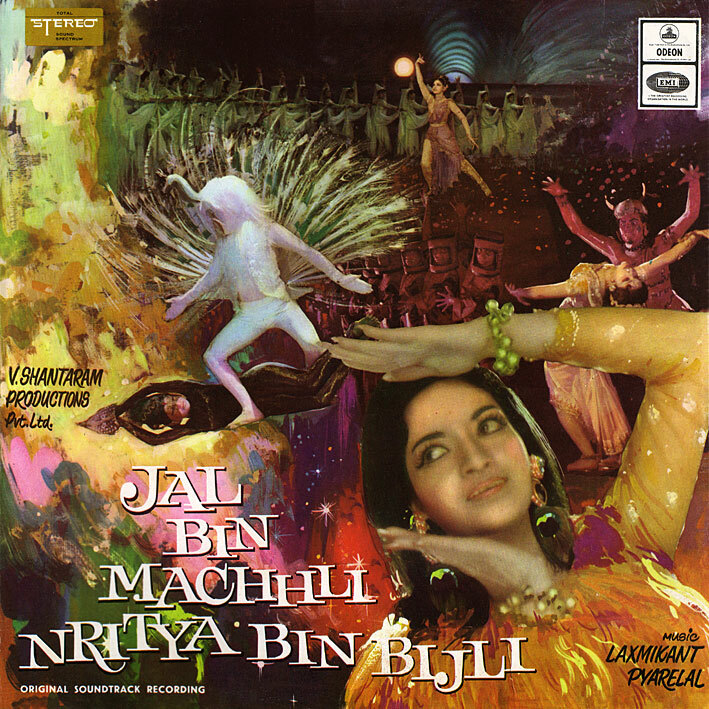 View it in full size, and tell me what the hell is going on in that picture, because based on it, 'Jal Bin Machhli Nritya Bin Bijli' looks like one bizarre, demented film. A woman dressed as a cobra, a menacing looking guy in a devil cap, another sporting a swan wig and peacock feathers, and chorus girls in... what, anti-radiation helmets? All painted in a palette of lurid colours. Chances are, I want to see this. And Laxmikant Pyarelal's score only strengthens the feeling; it's one of their best. While rooted in traditional Indian music (very few typically western elements, no funk, no Asha, no Rafi), it really is something else. Sparse, percussive, weird... and beautiful. Picking album highlights usually isn't a problem, but this particular soundtrack might be best listened to as a whole. However, if I must... 'Jal Bin Machhli' and 'Kajra Laga Ke Bindiya Saja Ke'; two gorgeous Lata Mangeshkar songs, sprinkled with weird sound effects and interludes. 'Jo Main Chali Phir Na Miloongi'; dramatic, urgent, and featuring an ominous sounding male chorus. 'O Mitwa Yeh Duniya To Kya Hai'; the last part consists of stunning, over-the-top orchestral experimentation. And there actually is a western element, spaghetti to be precise; I think most of you will recognize the famous Morricone leitmotif put to excellent use on 'Taron Men Sajke Apne Suraj Se'. Fantastic stuff. Thanks Reza, but I'll give that particular copy a miss; odds are the record is just as tatty. Re. the film, what I need to know is, are the visuals as bizarre as the LP cover (and some of the YouTube clips) suggest? Shantaram is a genius at song picturizations although I don't love his films from the 50s onward. But dances in his movies are always worth watching. This looks totally nuts though! :) I might have to give it a try! Your blog is totally out of this world. Great Music...great insight...great cover scan...great spirit...everything is so great. I don't need to say I am your Fan. 1. Whats this with 709x709 size of covers...why not 700x700 or rather 900x900. 2. Do you have high quality scans of these covers...I hope so...can you share them too with us. 3. I believe that you listen to current Bolly OSTs too. May be they are not released on LP. Would you like to share them too with us with your great presentation & insight...if you would, I will be very Happy & Thankful & believe that others here will too. Thanks for everything. You are awesome. I do not know what the title has to do with the film but yeah that is what it means. PC, I agree with you on the Morricone stuff put to excellent use. So good! I'm glad you're liking it. 1. 709x709 pt = 25x25 cm. Before, when I still bothered with burning downloaded albums onto CD and making covers, I found that to be an adequate size/resolutiuon for printing. I've just stuck with the format out of habit. 2. Afraid not, never had any use for the high res versions so I delete them as I go along. 3. To be honest, I don't. Very little I've heard post-1980, and practically nothing post-1985, has interested me. Plus, most current soundtracks are readily available anyway, so I wouldn't have seen any point in posting them. Thanks for the reply. No complains. But it would be nice if you could provide high resolution cover images for the future releases...& also of past ones those you have not deleted. Thanks & no need to say I am liking it. JBMNBB was the first Hindi film to be recorded in actual Stereophonic Sound, not simulated stereo. V Shantaram was a brilliant director and picturised his songs very well. The heroine, Sandhya, was V Shantaram's muse/favourite/lover/whatever and he always had her as the female lead in his movies. Sandhya's dancing was supposed to be good (average IMO) and her acting, the less said the better. IMO, skip watching the movie and just enjoy the beautiful music. If you haven't seen the film, I will suggest it to watch. The song picturisations are just unbelievable. Love the album PC. Thanks for sharing. Must try to get the album and DVD. I also look forward to your reply to Golu. Would love some insight on how to perfect my scans too. Ta. I fix blemishes etc. in Photoshop. Obviously I can't really supply a full tutorial, but essentially I use the clone stamp tool a lot. Plus I scan the covers in a high resolution so that when subsequently downsampling to the size I end up posting in, additional (smaller) blemishes disappear.